To create an event with multiple sessions, also called a series, here's how. When should you create a series? Sessions can help organize your events for a variety of use cases. Hosting a virtual conference? 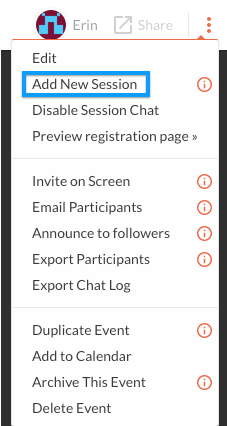 Add a session for each speaker or discussion. Your audience will have a dedicated chat, Q&A and polls for each topic. Creating a course? With a dedicated session for each class or module, your students can use the same URL to access each lesson and discussion. Got an extra long webinar? Broadcasts last 120 minutes each. Add extra sessions for more time and for better event organization and replays. For example, you can create one session for the presentation and another for Q&A. When transitioning to your next session, whether it starts in 2 minutes or 2 weeks, here's how to do it without losing your audience along the way. 1. End the broadcast in your current session. 3. When it's time, go live! Pro-Tip: Even if your next session doesn't start for a few days, "Call audience to session" will set it as the active session in your event. Whenever a participant visits the event page, they'll see what's up next (instead of a past session).